Paris Web - Registration for Paris Web 2016 is open! 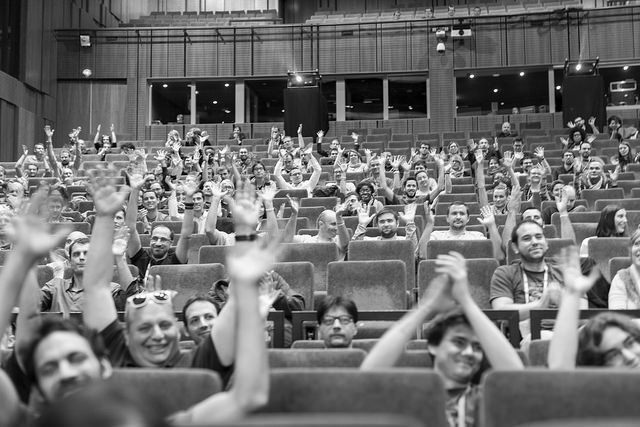 Registration for Paris Web 2016 is open! We just opened our ticketing for the Paris Web 2016 conference ! You can register now on our website https://inscriptions.paris-web.fr/. This year we'll hear speakers from different landscapes and different experiences. We'll have the pleasure and honor to welcome more than 40 speakers, including Amélie Boucher, John Foliot, Daniel Glazman, Léonie Watson, Bruce Lawson and Jen Looper. Please have a look at our website to read about our detailed agenda. The workshop program continues to simmer and will be released on June 28th, but you can already register now! Talks will happen during two days: September 29th and 30th. On October 1st you'll be able to join our workshops day. An unforgettable night is happening Thursday, September 29th, where everyone who wants to discuss in an informal and friendly way will gather together (limited places). Registration for the drink evening will open in September. Follow us on Twitter @parisweb or Facebook to get notified when the workshops agenda is published. Breakfasts and lunches are included in passes. A reduced price is available in a limited quantity for students aged 25 or less and job seekers. To get it please contact our team at contact@paris-web.fr attaching supporting documents (student card with a school certificate or a job seeker document). With these documents and the number of available seats the team will send you a discount code. These seats are attached to your name, non-cancelable and non-transferable. New year, but same venues ! You liked our venues last year: the conference will happen again at the Beffroi de Montrouge, and the workshops day will take place at the Web School Factory. To take part in this unique event you just need to register on our website: https://inscriptions.paris-web.fr/. The pass "Paris Web all included" includes both 2 days for the conference and the workshops day, including breakfasts and lunches. The price is only 390 € ( VAT included ). Don't think too much! For the 11th consecutive year we're happy to announce that Mozilla is once again a partner of ours. Since last year Mozilla also proudly organizes a web conference called View Source Conf. It happens this year in Berlin from 12th to 14th of September and in Seattle from 1st to 3rd of November. View Source is a conference for developers, by developers, where the participants will explore best practices and exciting new techniques in web development and design. During one track and two conference days, you'll see sixteen amazing main stage speakers, experience lively breakout discussions, take part to Q&A with industry experts, see lightning talks. On the View Source website you can send your talk proposal and register right now for early bird tickets! We'd like to thank our sponsors: Delicious Insights as a premium partner, Mozilla, and our partners Gandi and Web School Factory. We'll never say this often enough: this event can exist thanks to all our partners. So that you can optimize your communication both on our various media and during the event, and to support Paris Web 2016, we offer three main levels of partnerships as well as partnerships "à la carte" and an unforgettable night happening Thursday. You can find our partnership file in english on our website.